Geoffrey Farmer’s Leaves of Grass is one of the big hits of dOCUMENTA (13). Toronto critic Rosemary Heather caught up with the Vancouver artist by email to ask about the inspirations, processes and resonances behind the astonishing work—which, as Farmer noted, ended up surprising even himself. Rosemary Heather: There’s quite a story behind the making of Leaves of Grass. The work features a great number of figures cut out from the pages of Life magazine that have been mounted on dried-grass sticks. Someone told me there were 30,000 figures, but you have amended that, saying it’s closer to 16,000, which is still a huge number. Can you tell me a bit of the backstory here? Geoffrey Farmer: The collection of Life magazines came from the Morris/Trasov Archive. They (Michael Morris and Vincent Trasov) knew that I had been working with image collections, and about three years ago they asked if I might be interested in it. There were approximately 900 magazines in the collection, spanning five decades, from 1935 to 1985. In the beginning, Life was a weekly; in 1978, it became a monthly. So we had a lot of magazines from the 30s, 40s and 50s. We had fragments—a few pages—from 1935, and then complete copies after that. This includes the first issue that had Time co-founder Henry Luce as publisher; he bought it in 1936 and changed it to a photojournalistic format. The last issue we had, from 1985, was on AIDS. 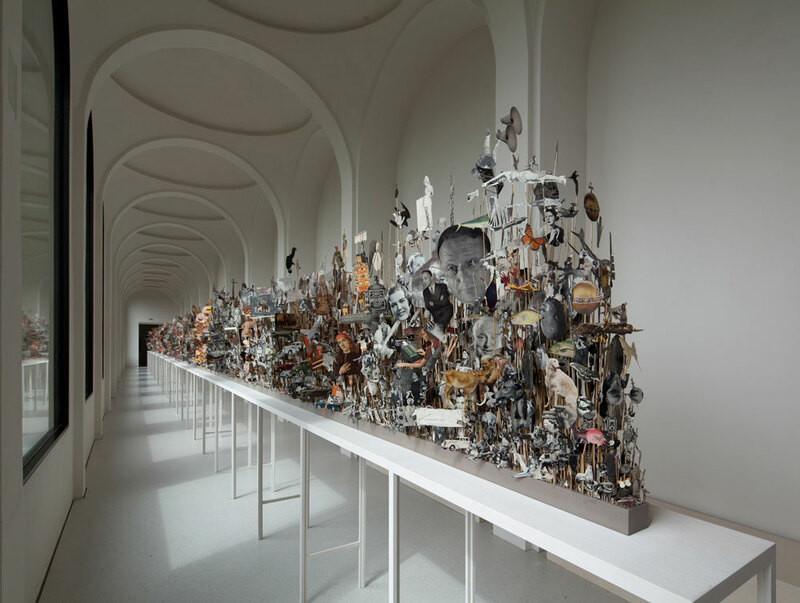 In Kassel, the work is displayed on the second floor of the Neue Galerie in the loggia, which is a long, sculptural corridor with huge arched windows overlooking the park. The view brought to mind the miniaturization of the world. I was already thinking about how photography has a tendency to make sculpture, and I liked this in relationship with the loggia. The piece is in chronological order and is displayed on a 124-foot table, which is viewable from both sides. There are 16,000 figures, and each figure has two sides. Although the image arrangements may appear chaotic, I took great care in their placement. During my studio visit with dOCUMENTA (13)’s curator, Carolyn Christov-Bakargiev, we talked about Paul Klee’s drawing Angelus Novus and Walter Benjamin’s essay “On The Concept of History.” I showed her a film made in 1961 by Arthur Lipsett, Very Nice Very Nice. In it, he uses images from Life, as well as found film footage and sound clips, all montaged together. It contained a quality I wanted to find for the piece. I mentioned to Carolyn that he committed suicide a few weeks before his birthday in 1986. She was curious as to what was happening in the world around the date of his death. So we were looking at timelines, and I began to think about chronology as a composition. It was a gruelling project, but I wanted to be transformed by the experience. In the last few months, we had about 90 volunteers helping us. We had quotas to keep. We worked in shifts. There was a small group of us who, in the end, I think, were working 20-hour days. I was amazed at the generosity of everyone working on the piece. It was a communal experience. A lot of conversation happens when you are sitting together working around a table. If someone didn’t agree with the image selection or strongly felt an image should be included, they would hold the image up for a vote. We had meals together, a fantastic cook and friend came in to make lunches and dinners. I wasn’t expecting the piece to grow in the way that it did. There is another story, though, that I want to mention because I think it relates in a broader sense. When I was very young, my teacher asked us each to bring a leaf to class. She then got us to place the leaf on a piece of paper. Above the paper was a metal screen stretched over a wooden frame. She lowered the frame, and then she gave us a toothbrush dipped in gouache paint to rub on the screen. When I rubbed the toothbrush over the screen, it sent out a fine spray of paint over the leaf and the paper. Then she lifted the screen, and then lifted the leaf off of the paper. Even though she was holding the leaf in her hand, it still appeared on the paper. This deeply shocked me. When I first saw William Fox Talbot’s early leaf-photo experiments, I recognized them as being linked to this early experience. When I read Roland Barthes’ Camera Lucida, I also had this recognition. Absence existing simultaneously within presence. RH: Your anecdote brings to mind a certain uncanny quality the work has. When the figures are cut out from the magazine and brought together again in the amalgamated form, the first thing you notice is the discrepancy in scale between them. This suggests their lost context (the scale that naturalizes each figure within its photo) and makes apparent the essential strangeness of the photographic format, which you evoke in your answer above. So is the work just an expression of a relationship you have always had with photographs, or is something else going on? GF: I think there are many things that are going on in this piece and I hope people get a sense of that. In one of the last issues of Life, I found a small image of Susan Sontag’s book On Photography. It is about one centimetre by one centimetre. It appears at the very end of the piece, next to a tiny Lady Diana. I think, in some ways, the piece is dedicated to Sontag and to her writing. Not to say there is a warning there, but perhaps there is. RH: So ideas about the work proliferate in the same way the figures seem to…this suggests why knowing their exact number is not important. There are enough of them to push the mind into the territory of something not previously experienced. Was this a goal you had in mind? Or did you set out to do one thing and in the end discover you had accomplished something else? GF: I am not really conceptual. I don’t think up a concept and then execute it. I learn through discovery and from direct contact with the material I am using. Even though the work might emanate out of an idea or interest and may have a horizon, I don’t really know exactly what I am doing. For example, the title partially came from the fact that I was using grass, in a literal way, to mount the images onto, but also because I was looking at Walt Whitman’s use of writing cut-ups to make the poems for his book Leaves of Grass. He spoke about wanting to write a modern portrait of the United States, and I thought that the piece could be looked at as a kind of portrait. I also liked that the first Documenta was in 1955 as part of a horticultural show, and that it occurred on the 100-year anniversary of the publishing of Leaves of Grass. There was a special article in Life on Whitman in 1955, with pictures of his grave that are now in the piece. I also liked that the term “leaves” can refer to the pages of a book and to grass—to something without much value. I thought this related to the form of a magazine. I didn’t really consider what the effect of looking at so many images would have on me. At certain points in the project, I had a hard time sleeping. When I closed my eyes all I could see were images. I was going through 30 magazines every morning to make selections. And then we would see them again for cutting, again for the gluing, again for the sorting and then again for arranging. I knew from the beginning that it was important the figures be placed in chronological order, and that their arrangement was important. It hadn’t occurred to me that it would be a strange kind of history lesson. It was like a slow-motion flip-book. It wasn’t until we had finished making the work that I realized the piece is very much about factory life. Factory farming, the war factory, the death factory, the automobile factory, the Hollywood factory, the personality factory…. History emerging out of a factory. In the end, it takes on the appearance of a conveyor belt. I was asked to pick a song that the viewer could then download as part of a dOCUMENTA (13) phone app. I chose Over The Rainbow as sung by Judy Garland in the movie The Wizard of Oz. American soldiers used to play it in Germany as a kind of anthem at the end of the war. In the movie, it is a hopeful song, but when listening to it and looking at the piece, it has another effect, making the piece, and history, feel like a very strange dream. You are currently reading Geoffrey Farmer Discusses His Documenta Hit at Army of YouTube.